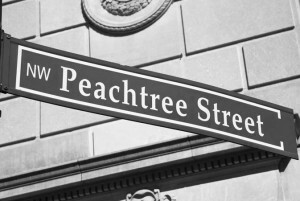 We’ve been serving clients as Atlanta court reporters for years now, and we’ve made it a point to have our offices located as centrally as possible so that no one faces an arduous journey toour facility. Below you’ll find all the information you need regarding how to get here from the airport, what transportation services are available and of course where you may want to stay while you’re in town. If you’d like more particularized help, simply contact our office and we can give you some pointers that will make your travel arrangements easier and your stay more enjoyable. If your witness is in Georgia, our office is easily accessible from the following areas: Norcross, Tucker, Decatur, Lilburn, Lawrenceville, Roswell, Peachtree Corners, Brookhaven, Stone Mountain, Chamblee, Sandy Springs. All hotels below have a shuttle between their hotel and the airport. Only two steps to come from Hartsfield Airport to Elizabeth Gallo Court Reporting. 1. From inside Hartsfield-Jackson Atlanta Airport, take the Gold Line North to the Chamblee Station. The MARTA train ride is about 30 minutes. Click here to download theMARTA GOLD LINE MAP. 2. Take one of the cabs that is at the exit of the Chamblee Station. From the Chamblee Station, our office is about 3 miles/10 minutes away. Below is a map from the Chamblee MARTA Station to Elizabeth Gallo Court Reporting.